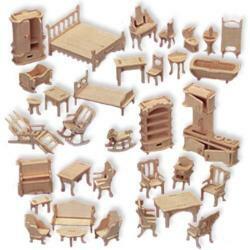 Wooden Furniture Set Wooden Furniture Set for miniature house models. Wooden Furniture Set for miniature house models. Check it out! This high grade 3mm plywood 3D Wooden puzzle kit is fun and easy to assemble! This puzzle kit comes individually shrink- wrapped with instructions & sandpaper included. Simply push out the pre-cut pieces and put them together in the appropriate slots. It can be finished with paint or varnish or left in natural wood. 3D Wodden puzzles are great for both children and adults, providing a fun, educational activity for the entire family.Once assembled, this model provides hours of fun play and is an excellent collection starter. 3D wooden puzzles are challenging and educational for children. Building a kit is a fun activity that also improves hand-eye coordination, provides practice in visualization, planning, and encourages creativity. This is a Woodcraft Construction Kit for furniture for a Doll House. There are 185 interlocking 3mm wooden plywood pieces and will make 34 individual furniture pieces. 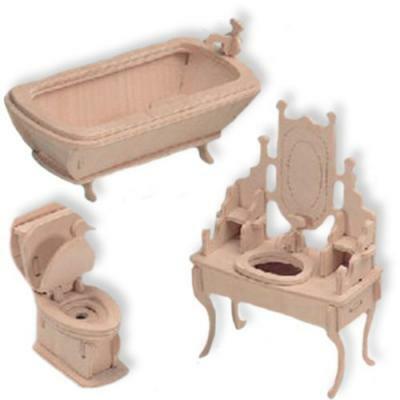 The size is 1/4 scale and make excellent furniture for our Fantasy Villa and Gothic Doll House Kit. Recommend for ages +7. These Woodcraft Construction Kits are 3D wooden puzzle marvels for kids of all ages. Not only are they fun to put together, but they are also educational and bring out the creativity of those working on them. The units are made of 3mm plywood and the pieces are individually slotted to interlock with one another to form a 3D model. Everything is pre-cut and assembled by pushing the pieces together. There is nothing to cut or glue. The 3D Puzzles are even paintable if desired. By Puzzled.